The selection of longboards is very wide. They come in various shapes, materials, wheels, and trucks. Choosing might seem difficult, but we will show you how easy it is to choose a longboard to suit your needs. In following chapters, we will describe various components, their properties and importance in longboards. To make it easier for you, we have prepared easy instructions for the right selection. Starting with the question, where will you ride your longboard? If you plan to ride predominantly in the city and you want to use it as a transportation tool, we recommend you to choose a short to medium length or a mini-longboard (cruiser) or a penny skateboard with soft wheels. Another recommendation is to choose a longboard with a curved up tail, known as kicktail. Thanks to the kicktail, you can lift the front wheels to easily overcome uneven surfaces such as holes, kerbs and other obstacles commonly found in cities. 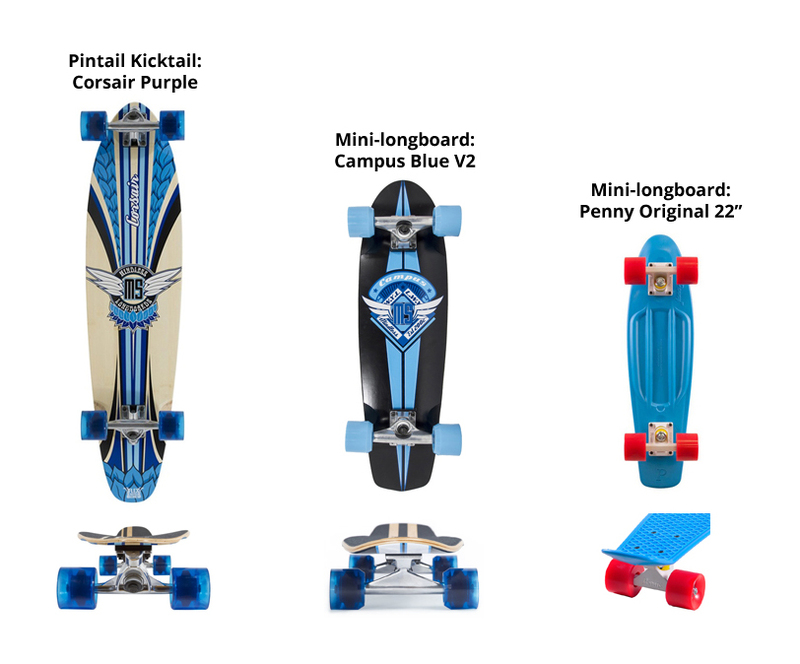 If you will ride mostly in city parks and skating roads and such, we recommend choosing a classic pintail longboard, when pintail is a fish-shape deck or an oval drop. An alternative would be DT longboards (Drop-tru longboards, DT are trucks mounted through the deck, which provides for higher stability). We don’t recommend too long decks over 105 cm and downhill longboards, which have a low deck height and are not suitable for riding in city and in parks. The picture depicts suitable types for city riding and their respective heights. The higher the longboard is, the faster it reacts and turns, but is less stable. Low longboards are on the other hand stable even in high speed, but are not as flexible as their higher colleagues. Orange-wheeled longboard is a combination between DT and pintail longboard, it has cut-outs which prevent the wheels and the deck from sharp turns. Outside-the-city riding doesn’t require any special features so you can choose practically from any longboard and focus on your riding style only. The common categories are carving, freeride, and downhill. Carving-type longboards encompass longboards suitable for hills and the enjoyment from wide turns, or so called dancing, which is basically dancing on a board. Freeride longboards are best for downhill and sliding. They have low profile thanks to DT trucks and are stable in higher speeds. Downhill longboards are great for downhill on steep slopes in high speeds. Their decks are high-profile with low-set gravity centre, decks are very thick and dense. The deck is always an essential component of a skateboard. Its shape, length and construction indicates what style of riding is the longboard most suitable for. 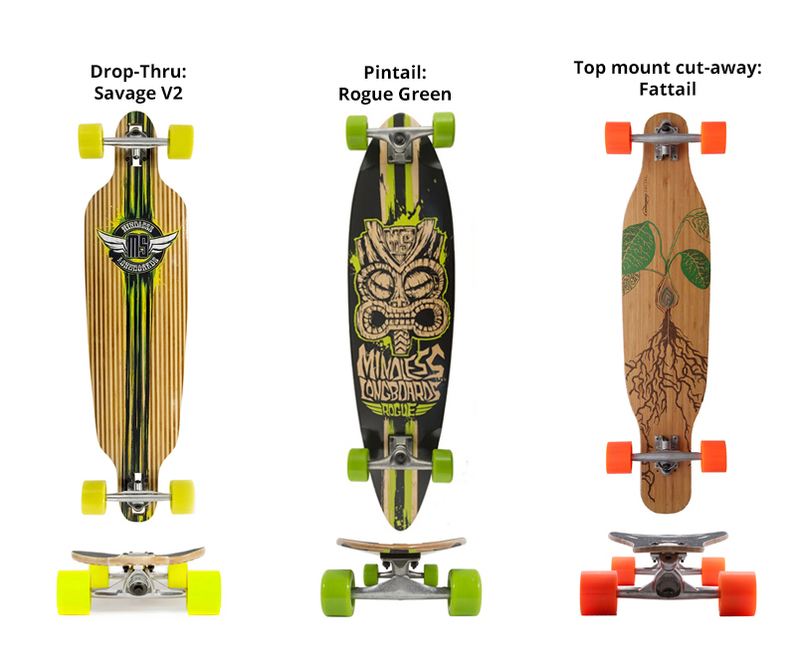 If you’re buying your first longboard, the deck should be as universal as possible (pintail), so you can first find out what you really want and consequently decide depending on you riding style. Longboards come in 4 basic deck shapes. Each type has its advantages and disadvantages, which depend on technical processing of the deck and users’ riding style. Deck length is another important characteristics, because it determines the riding style. Following table shows various longboard lengths and corresponding riding styles. 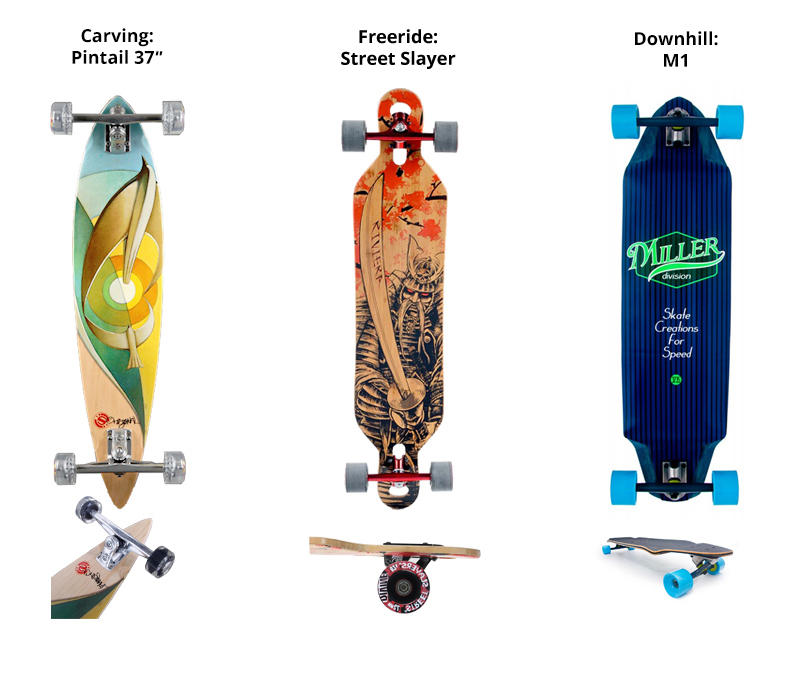 The basic shapes are pintail, drop-thru, hybrid and cruiser. Pintail longboard is the most common deck type. The shape reminds of an oval drop, usually completely flat. This shape is suitable for beginners. Hybrid longboards have cut-outs on the deck so the wheels can be mounted in a Drop-Thru fashion. The wheels are closer to the deck and the cut-outs prevents the deck from touching the wheels. Thanks to the Drop-Thru trucks the deck is more stable. Hybrid longboards are usually slightly shorter than other longboards, which allows the rider to do similar tricks as on a skateboard. Hybrid decks are suitable for downhill, freeride and carving. The first Drop-Thru mounting means that the trucks are mounted from the top of the deck. The second way is Double-drop. In double-drop longboards, the middle of a longboard is lower than the parts where the trucks are mounted, which results in higher stability in high speeds, which makes it suitable for downhill and freeride. 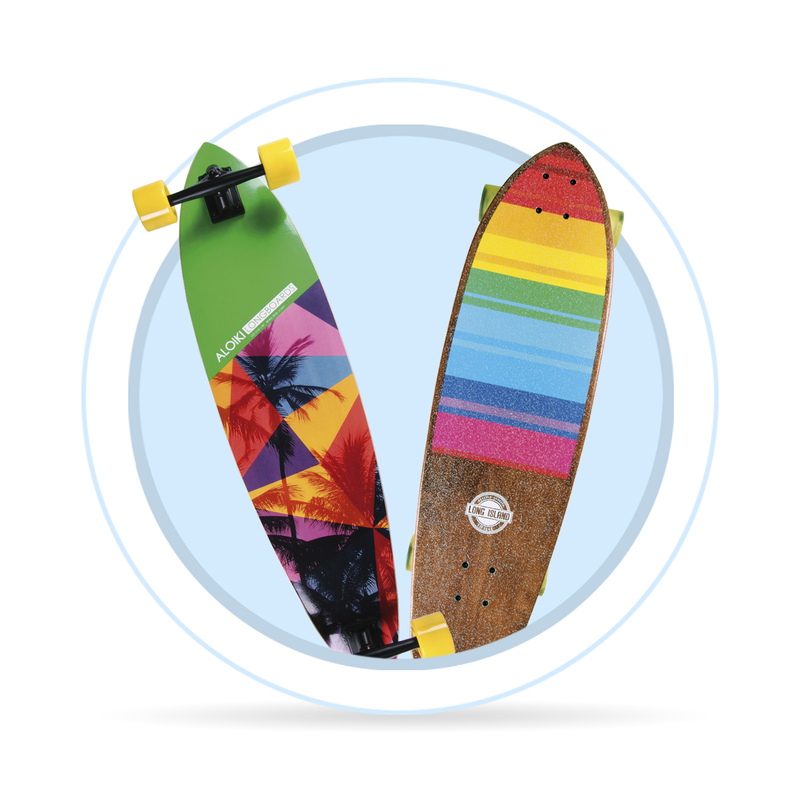 Cruisers are shaped similarly like classic skateboards, but they are longer and wider. You can do most tricks on them like on skateboard, higher weight and dimensions of the deck however require better skill.